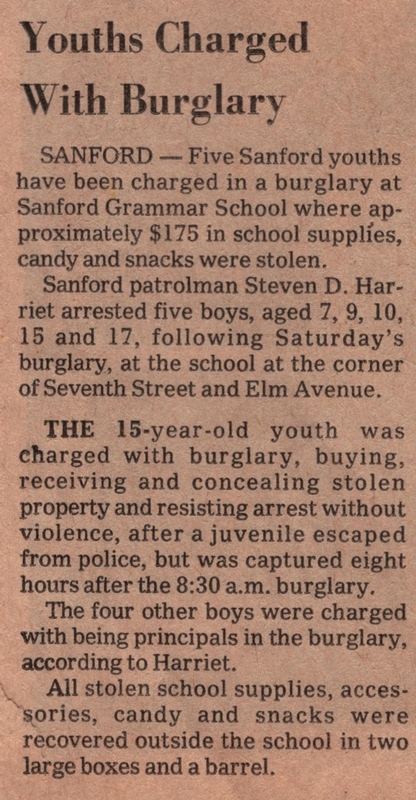 A newspaper article from the The Seminole Star about a burglary that occurred at the Sanford Grammar School in Sanford, Florida. Five underaged youths were involved in the burglary and charged with stealing approximately $175 in school supplies candy, and snacks. All stolen goods were recovered outside the school. Sanford Grammar School which is now the Sanford Student Museum and Public History Center, is a Romanqsque Revival style building designed by Florida architect Wilbur B. Talley and built in 1902. Also known as Sanford High School and the Margaret K. Reynolds building, it was designated as a National Historic Place in 1984. Original newspaper article: "Youths Charged with Burglary." The Seminole Star: Private Collection of Sue Blackwood. 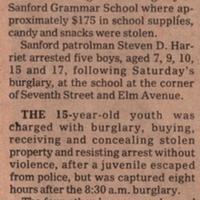 Digital reproduction of original newspaper article: "Youths Charged with Burglary." The Seminole Star. “Youths Charged with Burglary.” RICHES of Central Florida accessed April 26, 2019, https://richesmi.cah.ucf.edu/omeka/items/show/5212.